Up to 8 weeks in the house with the brooder and heat lamp. 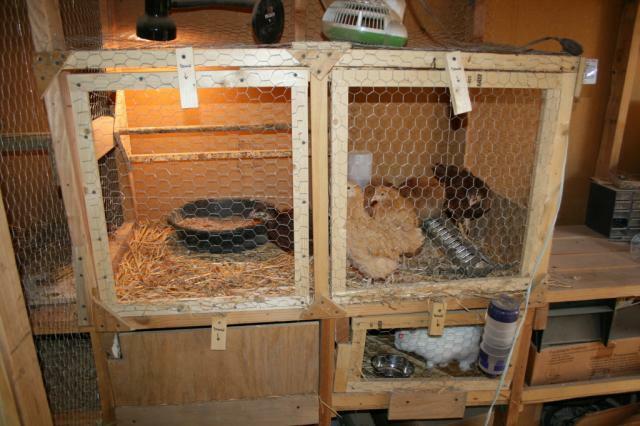 At 8 weeks, we move them into this brooder outside with the heat lamp. We leave them in there until they are fully feathered. You can see it is right next to the roost (to the left), so the chicks are visible to the other birds but separated to avoid injury. They are usually in there to about 12 weeks. To the left of the brooder, we cut a small opening in the wire and open it during the day, so the chicks can get in and out but the bigger birds won't fit in - a safety net so to speak. We keep that open for 4 weeks, and then put them in with the flock. There is the normal pecking order business but we have not ever had an injured bird following this method.